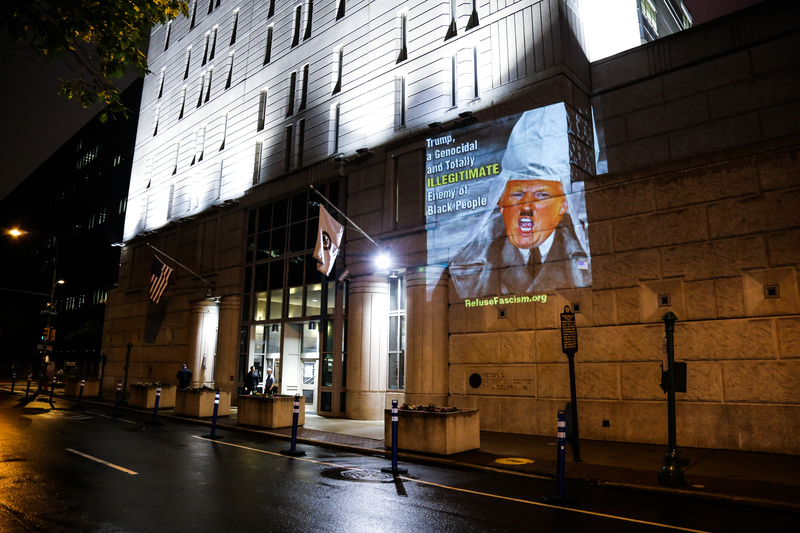 The photographs in this post were taken tonight, July 6, at the Federal Detention Center at 7th and Arch streets in Center City. 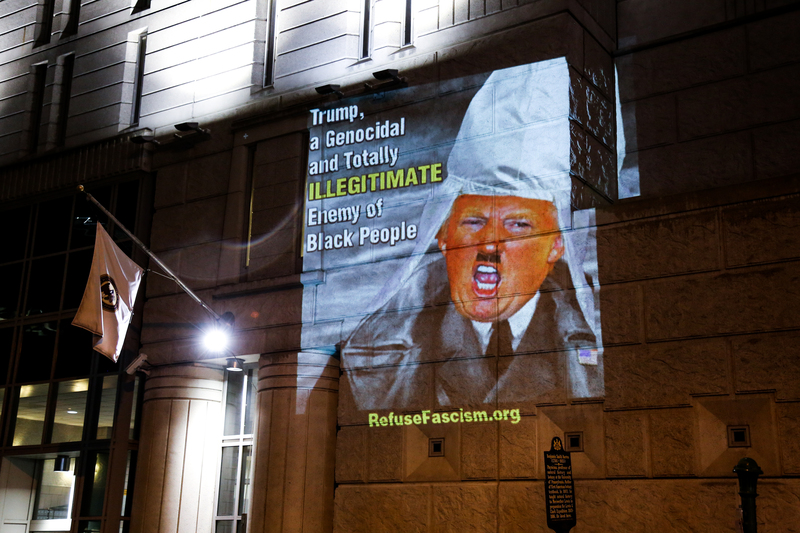 This was Refuse Fascism’s 3rd consecutive evening of Philadelphia projections. 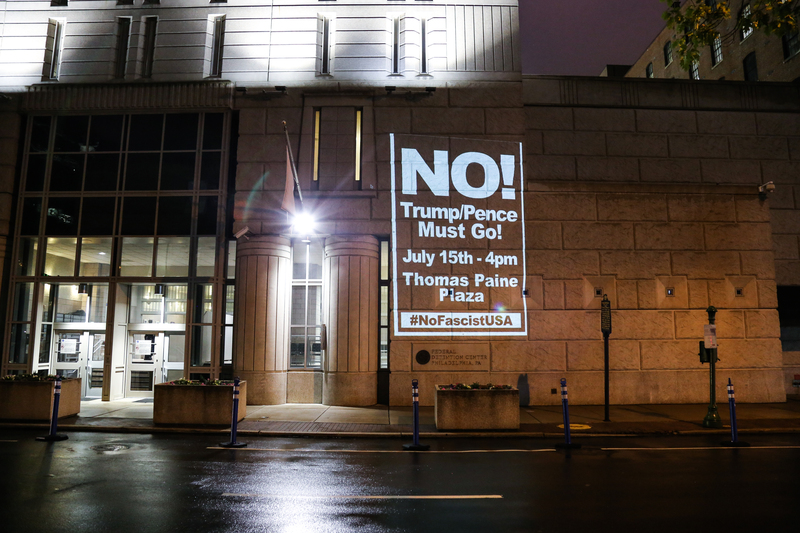 The July 15th demonstration in Philadelphia will be held at Thomas Paine Plaza beginning at 4pm. If you’re interested in seeing any of the nightly projections around Philly yourself, the organizers welcome you! 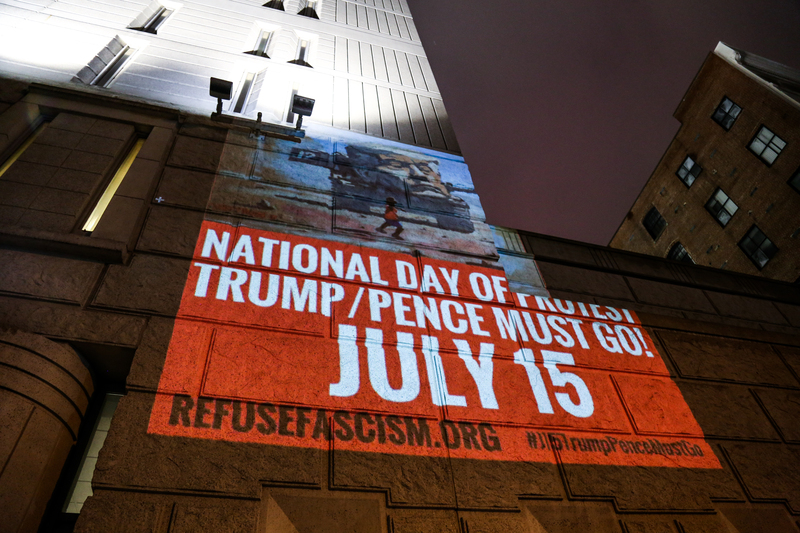 The location of each of the ten days’ projections will be announced from the Refuse Fascism Facebook page each day. Lastly, I feel the need to note this. After I got the photos you see in this post and I was beginning to leave, a group of about 8-10 Federal officials began to gather outside the facility (as you can see in the last photo below.) All of them had badges and uniforms, but it was dark so I couldn’t tell if they were cops or prison guards or what, so I’ll just call them “officials” here. One of the officials then shouted from across Race street to the organizers that, “You can’t do that, this is Federal property.” At the same time two other officials crossed the street. 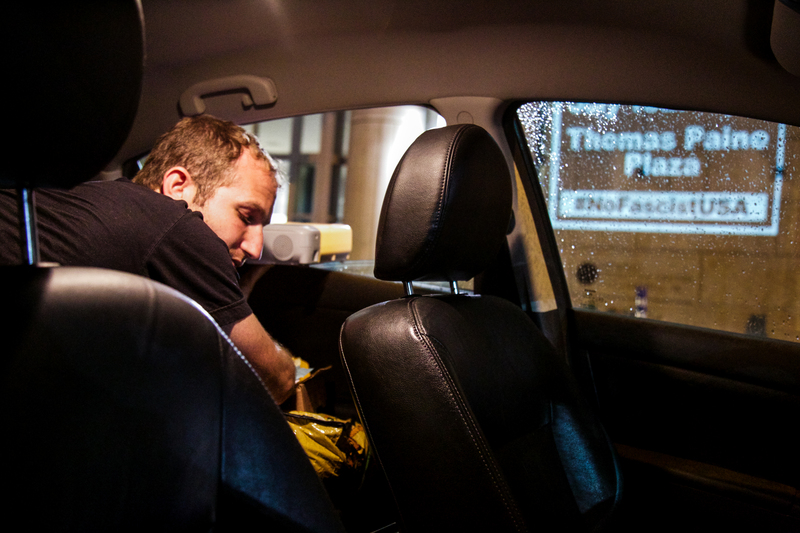 One quickly jotted down the license plate number of the organizer’s car, while the other talked to one of the organizers. 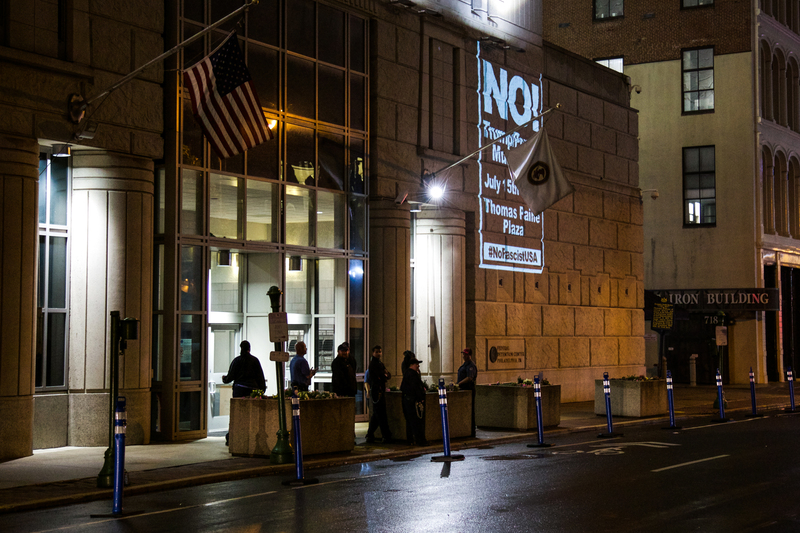 The Refuse Fascism organizer explained that what they were doing was completely legal and that they had researched it extensively before pursuing this course of artistic protest. Those two officials then crossed back to the stand outside the building with the rest of the group. In hindsight, it all seemed relatively harmless enough, well besides the one official jotting down the organizer’s plate number. And, just as someone who always tries to put myself in other people’s shoes, I can understand the officials’ suspicion of/interest in the unique protest. Nevertheless, I can not emphasize enough just how needlessly intimidating that interaction was. And I think it was that way because the officials just quite literally had no clue what to do. On my way back home to create this post, I could’t help but think how curial continued and regular training needs to be for anyone in the government who wears a badge. The world is changing quickly. A projection protest probably wasn’t even a thing when these men and women went through their training. If the people who work at Federal prisons are even trained on how to act when a protest is happening outside their walls. Who knows! 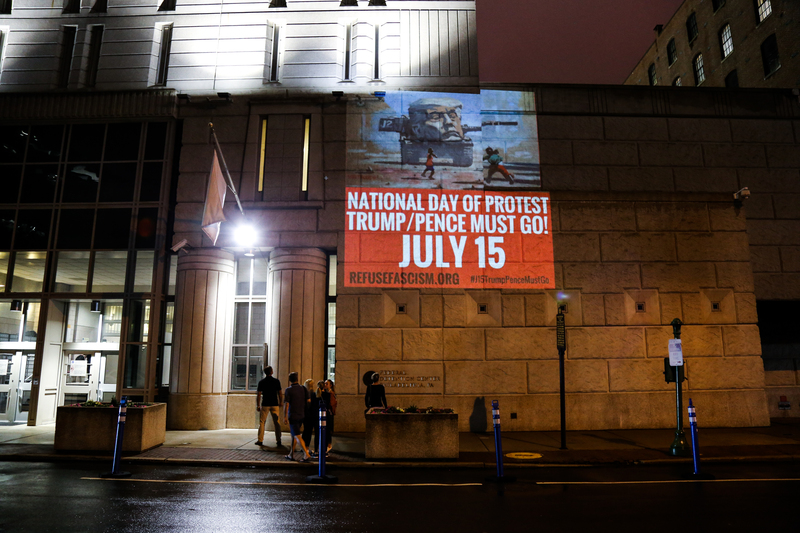 See photos from Refuse Fascism’s first-ever “NO!” projection outside the Roots Picnic here!